Coarse-grained textures generally indicate magmas that slowly cooled deep underground. Slow cooling gives crystals enough time to grow to easily seen sizes (i.e., larger than 1 mm). The first-formed crystals tend to have regular shapes because they grow freely into the surrounding liquid. Later-formed crystals find themselves competing for space with their solid neighbors; they are forced to fill in the irregular gaps. Thus, you can often figure out the relative order in which the minerals crystallized from the magma. The column of rocks below goes from most felsic at the top to most mafic at the bottom. The speckled coloring of this stone set in a barn wall (note concrete around edges) instantly suggests a coarse-grained texture. 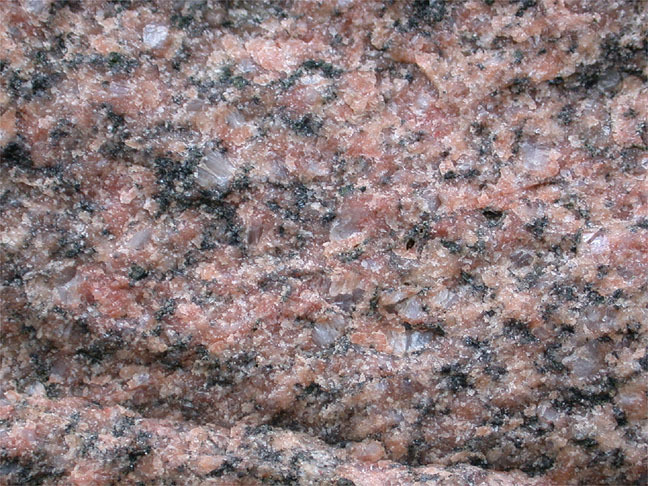 The photo below shows a close-up of the texture of this pink granite. The whole barn wall is shown in the thumb image on the igneous rocks page. 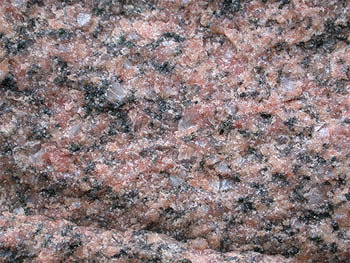 The pink K-feldspar, light gray plagioclase, and black amphibole are the most obvious minerals here. Quartz is harder to spot in the photo. The close-up view (click on image) shows that all minerals are about the same size and are complexly intergrown. 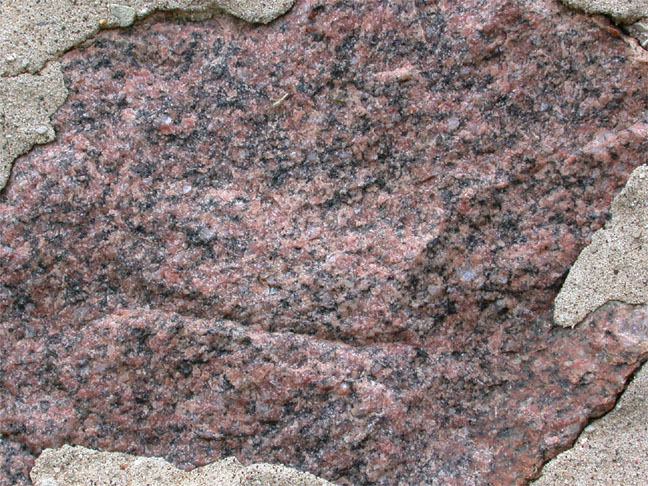 This is an example of an equigranular phaneritic texture. The speckling of this diorite again suggests a phaneritic texture. Diorite often has a salt-and-pepper appearance due to its mix of black and white minerals. Unfortunately, I have no super close-up for you. 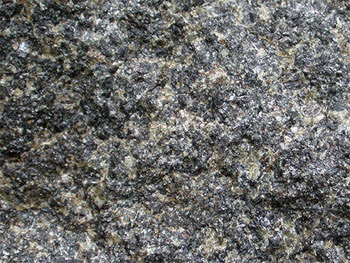 It is tough to see the mineral grains in this gabbro because they are all so dark. Only a faint speckling is evident. 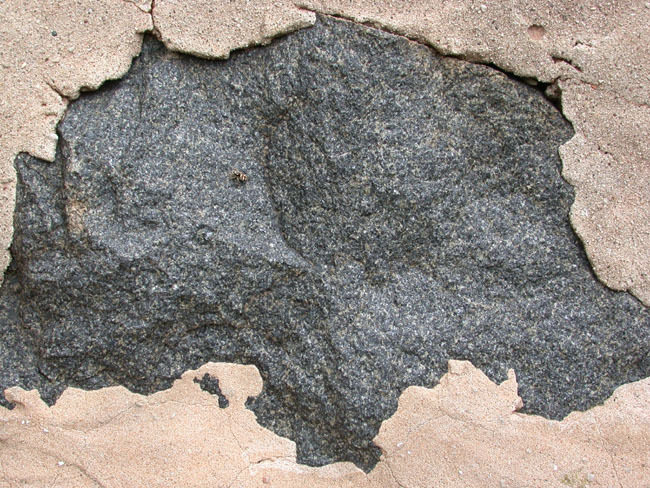 However, close examination (see below) does reveal the coarse-grained texture. This close-up view of the gabbro shows its phaneritic texture. Click on the image to see the black grains (pyroxene) surrounded by lighter grains of plagioclase. The coarse-grained texture is obvious in this sample of peridotite (pronounced "per ID o tite"). 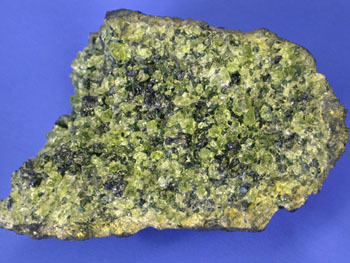 The green grains are olivine and the dark grains are pyroxene.